Performance of Hectare: About 7000 kilos on medium mixed land at 350 mt s.l.m. Harvest period: The first week of September for the Grillo, manual Harvest in bins. Vinification: hort maceration on the Skin at low temperature in reducing environment, soft pressing and controlled fermentation. The refinement occurs for most of its part on fine lees in steel tanks while a low percentage will be refined in french oak tonneaux until bottling time. It will be necessary an additional 1 month ripening in bottle so as Grillo reaches its highest organoleptic expression that is appreciated even one year after it has been bottled. ORGANOLEPTIC FEATURES: Straw yellow intense wine with green highlights that will turn into golden ones after ripening in bottle. The scent is captivating and longlasting characterized by mellow citrus notes, especially grapefruit, accompanied by tropical fruits, white-pulp fruits and jasmine in an harmonious complex which re-emerges in the rear of the nose. 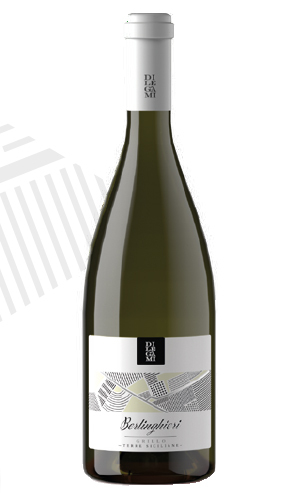 The flavour distinguishes itself in the structure and personality with excellent flavour and olfactory balance, provided with freshness and palate-persistent qualities thanks to a strong acidity and mineral characteristic. Suitable for fish starter, main and second courses with seafood and shellfish, white meat-based second courses, fresh and average structure cheeses. To be served at the temperature of 12-13 °C.